Keep truck contents in place -- eliminate damaged goods. 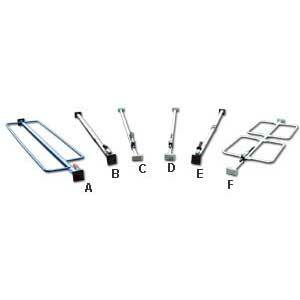 When trucks move, keep trailer contents securely in place with these easy to use Cargo Bars. All steel 1-1/2" sq. 14 ga. tubular construction won't bend or give. 4" sq. steel end plates on HCL-16, HCL-17, HCL-18 and HCBH-32. 4 x 2-3/8" end plates on HCB-7, HCB-7-R and HCB-7-S. End plates feature rubber pads for positive gripping action. Fits between trailer walls. Two piece model may be stored in cab. FOB Shipping Point. Style Letter Product No. Description Range Wt. (lbs.) Price Ea.